The information that global warming will hardly affect and change any region of the world as strongly as the Arctic is anything but new. Nevertheless, the audience became silent when the climate report “Climate in Svalbard 2100” was presented last Monday at a well-attended citizens’ meeting at the University of Longyearbyen. The result of the report: An average temperature increase by seven to ten degrees by the year 2100, significantly more and more intensive rainfall, melting glaciers, thawing permafrost soils, the retreat of sea ice and a shorter winter could probably radically change the everyday life of humans and nature on Svalbard within only two generations. Avalanches and mudslides would increase, the water in the rivers would rise and the height of the glaciers would fall by more than two metres per year. What sounds like the gloomy horror scenario of a bad thriller is actually a report brought up by the Norwegian Climate Service Centre for the Ministry of the Environment, backed by well-respected institutions from the fields of meteorology, energy and polar research. In this report, the researchers formulate forecasts in case that the goals of the Paris Climate Conference of 2015 are not going to be achieved. The average temperature on Spitsbergen has already risen by two degrees compared to pre-industrial times, and this is in fact noticeable. Reports of temperature records have been accumulating in recent years. The winter of 2012, for example, is likely to be remembered by most inhabitants, when rain, floods and glaze ice in January reminded more of an average autumn day in northern Germany rather than a polar winter in the northernmost city in the world, around 1000 kilometres from the North Pole. Last year, too, there were plus degrees and rain in Longyearbyen in January, and since 2010 there has been no winter with temperatures below the usual averages. The paradox is that Svalbard itself makes a considerable contribution to this development. The settlements are supplied with energy by coal power, the energy source that blows the most CO2 into the atmosphere. 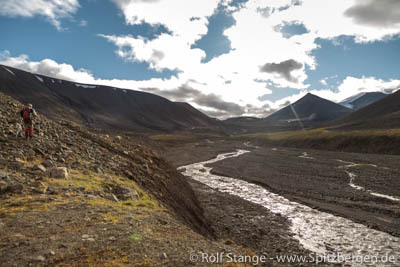 Besides coal mining, tourism is the most important employer on Spitsbergen. But tourists who travel to Spitsbergen primarily use the two most greenhouse gas-intensive means of transport, air travel and cruise ships. And also the locals use mostly airplanes and snowmobiles or cars powered by combustion engines. At the meeting, possible actions that Svalbard could take to help achieve Norway’s climate goals and limit global warming were discussed rather half-heartedly. Reduce the number of flights to and from Spitsbergen? Switch to renewable energy production? Neither the head of administration Hege Walør, nor Sysselmannen Kjerstin Askholt had answers to these questions. However Community Council Arild Olsen came up with the radical idea to make Longyearbyen Norway’s first zero-emission community. Whether this is realistic remains to be seen. Hardly anyone denies, however, that adaptation to climate change is urgently needed, will cost a lot of money and could possibly lead to changes in legislation. In December 2015, temperatures of up to nine degrees plus again caused thaw and flooding. This river in Bolterdalen is normally dry and frozen in winter.